"Taken on one of my favourite walks on the South Coast, the five mile loop along the top, and back along the foot, of the white cliffs of the Seven Sisters. The walk along the bottom of the cliffs should be done on a falling tide, in order to avoid getting trapped by the tide, as there is no escape from the shore for the entire length of the Seven Sister cliffs. As the tide falls, many pools are left along the shore providing good photographic foreground subjects. 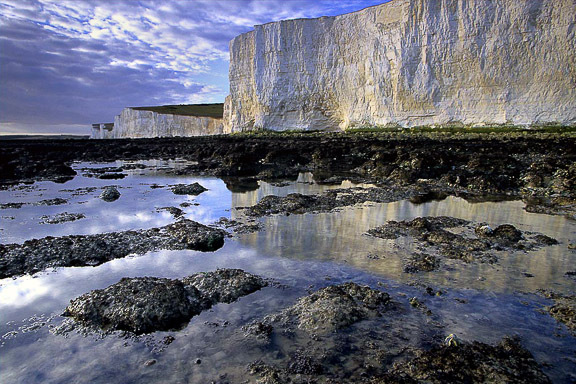 These pools often provide the opportunity to take shots that include a reflection of the striking white chalk cliffs."